There are many technical aspects to both printing and embroidery, and often customers have questions about the processes behind each. We’ve put together some common questions we come across in the hopes that it will help answer any that you might have! Questions about artwork and the specifications we require. This is by far our most common question! Our pricing is based on quantity, so unless you provide a range it's hard for us to give you any numbers. The easiest way for us to help you is for you to fill out our Request a Quote form. For Screen Printing, our minimum order is 24 pieces. For Embroidered Patches, our minimum order is 30 pieces. Otherwise, for DTG Printing, Embroidery, and Heat Transfers, we do not require a minimum order. 3. I'm not sure what I want-- can I stop by the store? Please do! We love interacting face-to-face with customers. Susie and Alexis will be able to advise you on your best options for your project. We also keep a wide selection of apparel samples for you to touch and try on. 4. Which forms of payment do you accept? We'll happily accept cash, company checks, and Visa or Mastercard. We do not take Amex or personal checks. 5. Do you ship orders? Yes! Please let us know ahead of time if you will not be picking up your order at our shopfront. We will estimate your exact charge once we're able to weigh out your apparel, but generally our charges are $12-15 per box. 1. What format does my artwork need to be? We have a couple different requirements, depending on the type of job you want. 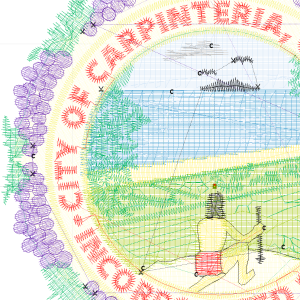 300DPI .JPG/.PNG/.TIFF or Vector .AI/.PDF/.EPS preferred, but not required. We're able to work off of photographs of previous embroideries, if you're trying to duplicate an older one. We do recommend that any text have a minimum column thickness of 1mm, and a minimum height of 4mm. 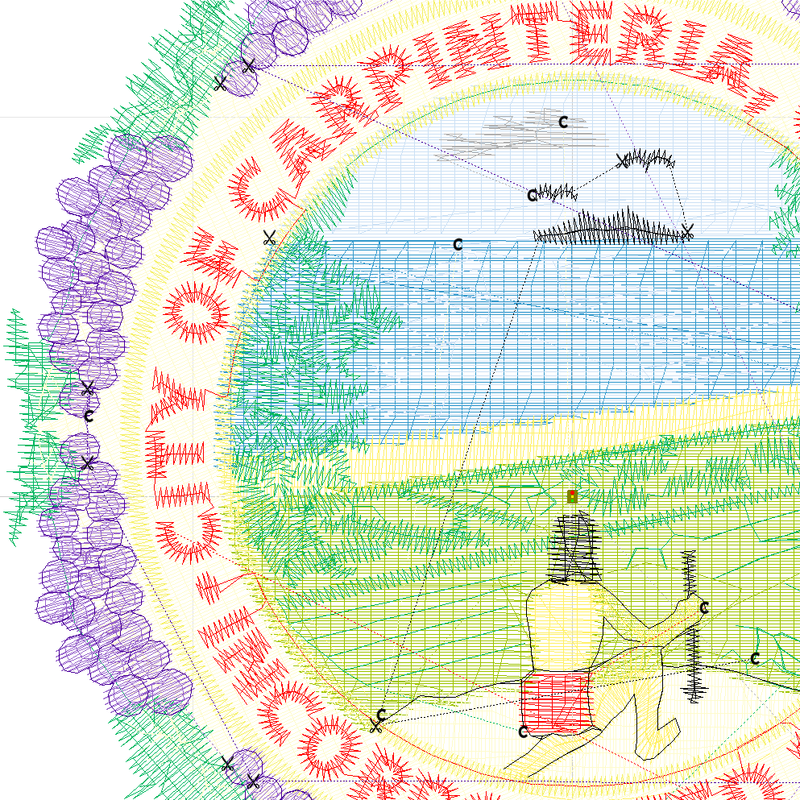 If you send us artwork with text smaller than these measurements, expect us to contact you with a revised version that will work for embroidery. We're able to work with lower quality artwork, but keep in mind it may affect the quality of the print. If your artwork is not in Vector format, we will have to charge an additional fee to convert it. 3. Can I see a sample before you fulfill the rest of my order? Because our process differs based on your job, the answer can vary. Read below to see what we're able to do for you. If you are getting your design Digitized through us, then a sample embroidery is included in the cost of Digitizing. You will be able to review our sample to make sure the colors and design are exactly how you envisioned before we put the order into production. If we created a text-based design using our pre-loaded fonts, then a sample embroidery is NOT included. You will have to cover the cost to see a sample, which will be based on the amount of stitches in your design. A sample patch is included in our price. We will email it to you for approval before moving forwards with the rest of your order. We are able to print a sample, but it will not be included within the price break the rest of your order receives. It will cost the same as getting a single t-shirt printed, so it will be more expensive than your other shirts. We are not able to print samples, outside of specific circumstances when ordering quantities of 100+ items. It is very time consuming and costly to run a single t-shirt with Screen Printing, as it involves all of the screens to be set up twice, and the additional fees are generally not cost-effective for the customer. We are not able to provide samples. 4. What is a Vector Image? Unless you are a graphic designer yourself, you may not know what a Vector image is. In order to describe what a Vector image is, we must first describe it's counterpart, a Raster image. Please read below to find out more. A Raster image is made up hundreds (or even thousands) of tiny dots of color, called pixels. Photographs are the most common type of Raster image. With Raster images, what you see is what you get. To make your image larger, the pixels get blown up past their usual size. This distorts the pixels, which makes the whole image blurry. We can use Raster images for DTG Printing and Embroidery, if the quality is good. In fact, DTG Printing works great with things like photographs and drawings! But if your image file is a smaller size than you want it as a print, resizing it may affect the quality. 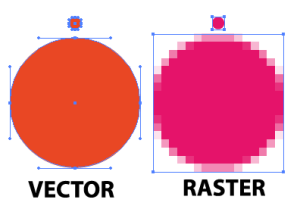 If your image ends in one of these file types, you can be sure it is a Raster! A Vector image is made up of mathematical points and curves. Common examples of Vector images are fonts and logos. They are widely used for logos because Vector images are infinitely scaleable. This means you can make your image infinitely bigger without loosing any quality. You can resize it from the size of a business card to billboard size and it will look just as crisp. We require Vector images for Screen-Printing and Heat Transfers. We can also use them for DTG Printing and Embroidery, though it is not required. Here are the most common Vector file types. 5. 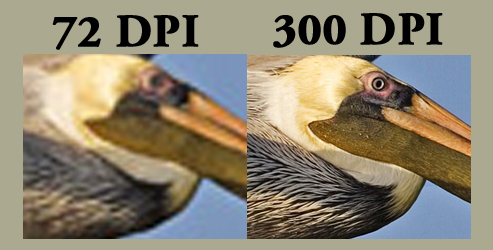 What Does 300DPI Mean? DPI refers to "Dots Per Inch", which is a term used in printing to describe how many dots of color can be found in each inch of a print. There are several standard amounts for DPI, based on what you are using the image for. Most images found online are displayed at 72 DPI, because it results in the smallest file size, which means they will load faster on websites. The standard used for print. Images at 300 DPI will look much richer in detail and color than images at 72 DPI. Generally reserved for fine art and photography prints. We prefer printing artwork at 300 DPI as it gives the highest quality results. We have not noticed a visible difference between 300 DPI and 600 DPI when printing on apparel due to the fabric fibers. 1. Why am I not receiving the same price break on all my items? There are several reasons your items may not receive the same price break, though they are all service dependent. We have different techniques to mount each item onto our embroidery machine, and must embroider them in separate rounds. This requires us to give them each separate pricing. We cannot combine Light-on-Dark printing with Dark-on-Light printing. Say for example you are getting the same design printed on both white and red shirts. White shirts are Dark-on-Light printing, but Red shirts are Light-on-Dark printing-- therefore we must give each separate pricing. However, if you are getting the same design on red, blue, and green shirts. All of these are Light-on-Dark printing and would receive the same pricing. Each individual design receives its own price break. This means that if you are getting three shirts printed, but each has a different image, they will all receive separate pricing. If you are using one of our pre-loaded fonts, you do not have to pay our digitizing fee! Our Digitizing fee is a one-time setup fee to create new custom Embroidery designs. We include a free sample embroidery, so you can make sure the colors and sizing are all what you envisioned before we embroider any product. Our embroidery machines use a special type of file, specifically meant for embroidery. Called .DST or .PXF files, these contain information about the amount of stitches, the direction the stitches go in, when to switch to a new color, etc etc. This means that we can't just use a normal image file for embroidery-- we must convert it into one that our machines can read. Take a look at the middle image below to see how all the individual stitches are plotted out. This only applies to the first time you have a particular design embroidered. If you place an order for the same embroidery in the future, you will not have to pay for the set-up charge again! However, if you make changes to the artwork and want the embroidery to reflect those changes, we will need to charge an Editing Fee. The inks used in DTG Printing are unlike the Plastisol ink used for Screen Printing. They work like fabric dye, and permeate the fibers instead of sitting directly on top of them-- this is why DTG Prints retain the original softness of the fabric. However, the DTG inks are somewhat translucent. This means that if you print on any color other than white, you will see the fabric right through the ink colors. While this works for some lighter shades of fabric like pink, baby blue, or heather greys, it does NOT work for dark or very brightly colored t-shirts. Because of this, on dark t-shirts we must first print an additional layer of white ink. This gives the DTG inks a white background to lay on, so you're able to see the colors against the fabric. White ink is more costly compared to CMYK (color) inks, and we must first pre-treat the fabric so the ink will stick and not wash out. We must charge slightly more, due to this process being more involved. Say your design has 3 colors, but you are being charged for 4-- what gives? If the color of your t-shirts is white, or something equally light, chances are we made a mistake and need to revise your quote. If you are printing on dark t-shirts, then we have a reason for the additional charge. Screen Printing ink is not 100% opaque. If you are having a design printed in any color other than black, there is a chance the fabric color will show through your design slightly. If you want a light-colored design printed on a dark-colored shirt, we first lay down an extra layer of white ink under your entire design. Without a white underlayer, colors printed on top of dark fabric can come out looking faded. By putting white underneath your design, it gives the additional colors a lighter background to sit on than the dark fabric-- making your colors pop!